Last Sunday 22 March was celebrated the inauguration of a truly one-of-a-kind building in the Bazaar Beverwijk, The Netherlands. The building in question is a gold market designed by the firm of Liong Lie Architects collaborating with Leaders against routine, a Gold souk. Europe finally has a big indoor gold market, equaling other continent's gold markets such as the well-known souk of Dubai, the City of Gold. In this new building there is place for 29 jewelry shops for gold dealers and goldsmiths. But, what is so special about this building? With 1430 m² and 35 meter long facade this cave-like building has a gold bar shape. 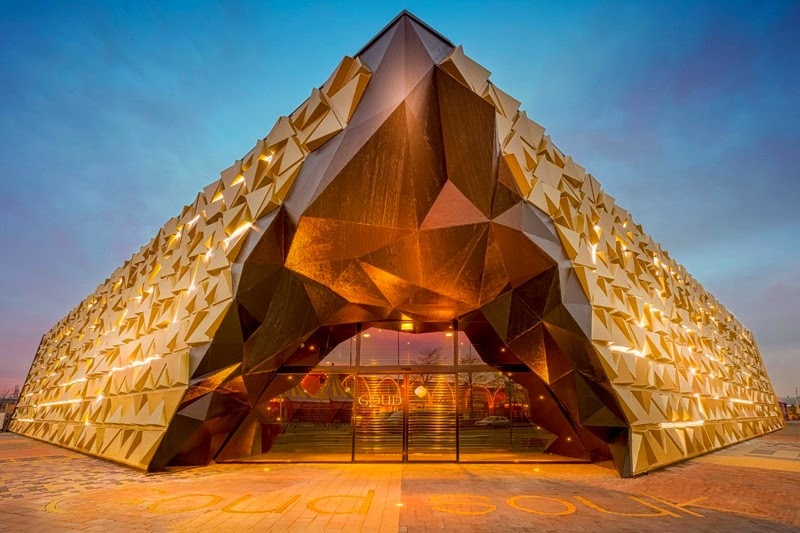 The exterior has golden triangular patterns that shines day and night, and leaves no doubt on what the visitor can find in the inside. In contrast to the shiny facade, the interior is simple with black floors, ceiling and walls, and a well thought lighting that draws the attention of the visitors to the displayed golden masterpieces. The building is already crowded with visitors and curious, as well as gold buyers from all Europe. In summary, it is an innovative and refined building from the standpoints of both design and gold market. Obviously, it has also been designed bearing in mind its safety and protection, in case any burglar fan of this precious metal chooses to give a big blow. This precious metal has always been a symbol of beauty and elegance, nonetheless its advantages as profitable and stable asset have been the ones that attracted Emgoldex clients. The company offers investment gold bars and the possibility to create a gold business with which thousands of clients around the world have achieved financial independence! Share the latest news of the gold world in your social networks and give the most profitable opportunity to buy gold!